This was a fun read. Here’s your opportunity to use different voices, if you’re so inclined. The illustrations are really cute and it was great watching my students smiling and then clapping at the end of the book. Big dinosaur wants little dinosaur’s jelly beans. Little dinosaur can’t give them away, because they belong to his friend. Big dinosaur really wants those jelly beans… a lot. 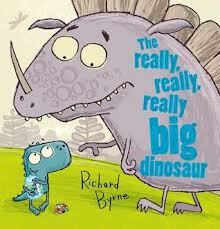 The little dinosaur says his friend is really, really, really big. “Everyone knows I’m the biggest and strongest dinosaur around here!” Big dinosaur starts boasting about all the ways he is better than little dinosaur’s friend. Ooops. Big dinosaur gets his just desserts in a very funny way.